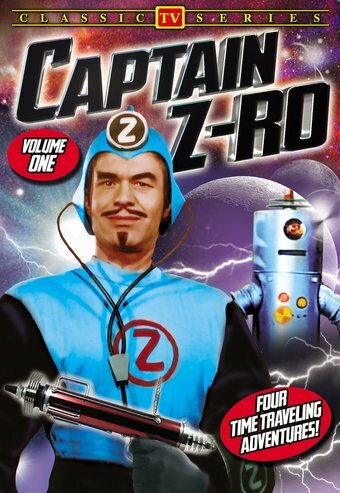 Captain Z-Ro, time traveling superhero from the far future, protects history from those who would change it in four episodes of this classic sci-fi show from the early days of television. The first authorized release of this groundbreaking series. In a secret fortress hidden somewhere in the remote, uncharted regions of the Earth, scientist Captain Z-Ro monitors human history through his Time Screen. Whenever events unfold contrary to the history books, Z-Ro and his young companion, Jet, use their time machine to go back in time and set things right. With the trustworthy Roger the Robot and their spaceship ZX-99, the brave explorers in time and space learn that the best way to plan for the future is by learning from the past. Premiering in syndicated markets during the 1955 holiday season, Captain Z-Ro's mix of sci-fi action and educational content quickly made it "the best children's show on television", according to the Kefauver Committee on Juvenile Delinquency. Creator and star Roy Steffens (née Steffensen) had previously produced a 15-minute version of the program for local live TV in California. All the episodes were directed by David Butler, who made the charming futuristic fantasy Just Imagine (1930). Though the series has not been shown on television since it left syndication in 1960, it was highly influential on later time travel shows such as the BBC's Doctor Who (1963-1989) and NBC's Quantum Leap (1989-1993). The similarities were not lost on Quantum Leap's creators, who showed star Scott Bakula watching Captain Z-Ro in the last episode of that series. Unseen in decades, Captain Z-Ro has been lovingly transferred from the original 16mm prints to ensure the highest quality. CHRISTOPHER COLUMBUS: Jet helps Christopher Columbus overthrow a mutiny on the Santa Maria. THE GREAT PYRAMID OF GIZA: Captain Z-Ro sends Roger the Robot to Ancient Egypt to prevent thieves from looting the Tomb of King Tut. DANIEL BOONE: Jet learns that Daniel Boone is in mortal danger, but is captured by Indians when he tries to help. MARCO POLO: Captain Z-Ro and Jet race to save Marco Polo, who is being brutally tortured by treacherous warlords.